Photos of endangered wildlife and an image of Cecil the lion were projected on New York's iconic Empire State Building on Saturday as part of a promotion for the documentary film "Racing to Extinction." 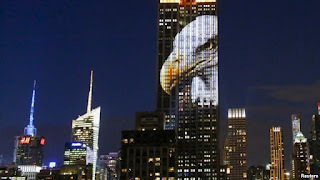 People gathered in streets and rooftops in Manhattan to see the image highlights that covered 33 floors of the building. Cecil, the lion killed during a controversial hunt in Zimbabwe by an American dentist, was among several animals highlighted on the building. "I think it is a wonderful message to get out there, especially in light of the events that happened in the past week, which I was very upset about and I was glad that what happened with the lion, but his brother has taken it upon himself. 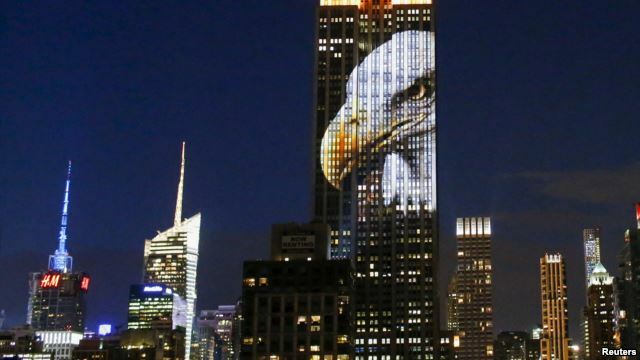 But I think the world needs to be aware of how fragile and how mankind is so abusive to animals worldwide," said Travis Threlkel, the chief creative officer of Obscura Digital and one of the people who created the projection event. Organizers called the event, which lasted several hours, the first of its kind. They hoped it would spark conversations about extinction. The White House has received more than 220,000 signatures by Americans demanding the man who killed Cecil be extradited to Zimbabwe for trial. Zimbabwe has requested extradition of hunting enthusiast Dr. Walter Palmer, a dentist from Minnesota who has been accused of illegally killing the lion. Cecil was a subject of research and had become popular through videos showing him walking leisurely in the wild. The possibility that he was lured out of a protected national park to be killed as a trophy has enraged many Americans. Palmer reportedly paid more than $50,000 to shoot a lion in Zimbabwe. But conservationists point out that more revenue can be made by keeping rare animals alive and showing them to tourists. Palmer has admitted killing the 13-year-old lion, but told the U.S. Fish and Wildlife Service that he had hired professional guides and was unaware that Cecil was protected. Meanwhile, another American is being accused of shooting a lion with a bow and arrow in an illegal hunt several months ago in Zimbabwe. Zimbabwe's National Parks and Wildlife Management Authority says the hunt took place in April around Zimbabwe's Hwange National Park. A Zimbabwean landowner was arrested in the case and is assisting police, the authority said.